A comic farce in full ludicrous glory! AboutFace Productions have done it again with their latest show “Backstage With The Thurmans”, a hilarious sleight of hand with masks, music, illusion and a performing bear. As the Thurman Family Ensemble prepare for their on-stage performance they are completely unaware that the audience is witnessing all their backstage intrigues, mistakes, technical breakdowns, tantrums and high drama. When the Thurmans realise that their backstage antics are being observed, they must perform an about face and turn chaos into triumph! Can they do it? Well, maybe. Come and find out for yourself. 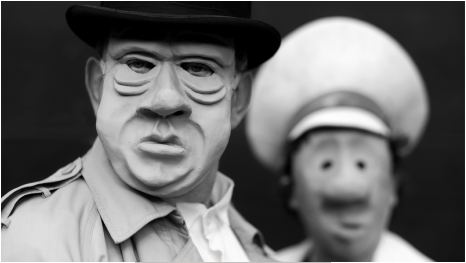 The comedy is in the expert “ineptness” of the performers … this is AboutFace at their absurdist best. The Thurman Family Ensemble are performed by: Sue Blakey, Tim Denton, Nadine Dimitrievitch, Annie Forbes, Steve Scott, and introducing Belinda the Bear as himself. Click on this Facebook icon to go to The Thurmans' Facebook page and get the latest update on their antics! Venue: Fringe Hub - Rehearsal Room - North Melbourne Town Hall, 521 Queensbury Street. We gratefully acknowledge all those who so generously supported our POZIBLE campaign.